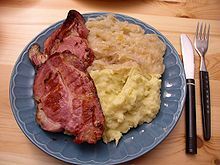 Kassler served with sauerkraut and mashed potatoes. Kassler or Kasseler in German cuisine is the name given to a salted (cured) and slightly smoked cut of pork similar to British gammon. It can be either hot or cold smoked. Pork necks and loins are the most often used cuts although ribs, shoulders and bellies can also be used. It is often served with sauerkraut and mashed potatoes. In addition to pork, chicken prepared 'Kasseler' style is available at some butchers. It is unclear where the name comes from. It is often said, that the name derived from a Berlin-based butcher called Cassel who prepared the cut in the late 19th century. However, records of the town's inhabitants show that in the 19th century no butcher named Cassel or Kassel was living in Berlin. Likewise, it is not possible to prove that Kasseler comes from the German town Kassel. In Finland, pork neck of any type is called kassler. A similar dish, hamburgerryg, is eaten in Denmark. In this variation the meat is boiled. It is often served with a glace of either honey or mustard. In Norway, hamburgerrygg is smoked, while the unsmoked variant is called benfri svinekam. Wikimedia Commons has media related to Kassler. ^ Foede, Petra (2009). Wie Bismarck auf den Hering kam. Kulinarische Legenden [How Bismarck came to be applied to hering. Culinary legends] (in German). illustrated by Daniel Müller. Zurich: Kein & Aber. pp. 127–130. ISBN 978-3-0369-5268-0. OCLC 466113943. ^ "Kassler". Glossary. Nordic Recipe Archive. Retrieved 2010-06-17. This page was last edited on 11 May 2018, at 13:53 (UTC).